RIR presents Russia’s main tribute bands: from The Beatles to the Red Hot Chili Peppers. Not all stars of the world music scene make it to Moscow, never mind smaller towns and cities in Russia, but that does not mean that millions of fans across the country can’t get to see their idols. Today there are many cover bands coming out of the wings that replicate not only the original songs, but even the appearance of the gods of rock. It’s not too hard to guess the inspiration behind Easy Dizzy, Russia’s first and only official band to cover the hits of Australia’s finest rockers. They’ve been doing it for so long and so well that Sony Music, which owns the rights to AC/DC’s songs, gave the tribute band official permission to use them. 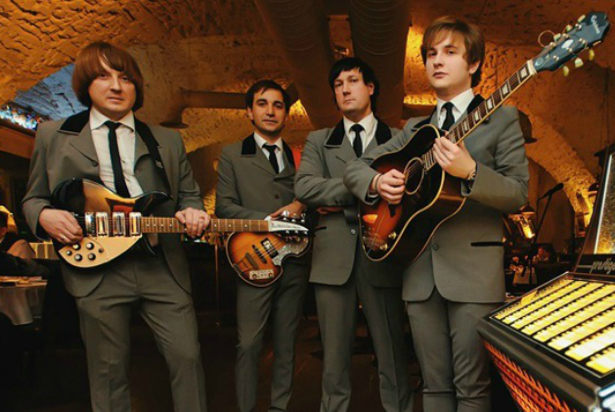 There are many more Russian groups covering The Beatles — a lot more, so many that they cannot be listed. But perhaps the best practitioners are The Birds from Moscow, who skillfully imitate even the voices of the Fab Four. Screw up your eyes at one of their concerts and it may seem that John, Paul, George, and Ringo are really there on stage. Wherever The Beatles are, you’ll also find The Rolling Stones, who, incidentally, also began their musical career by covering other people’s songs. Today in Russia some of their glory has rubbed off on Stone Shades, five young guys in action since 2001. It really has to be a labor of love to even try to imitate the facial expressions and pelvic gyrations of Mick Jagger. It’s nearly impossible, after all. Valery Setkin, vocalist and pianist in the group RawCats’88, went much further. He doesn’t simply copy his idol Elvis Presley, but lives like him. His wife dressed up as Priscilla Presley for their wedding, and his daughter is called Lisa. Members of the group GKChP, who perform the hits of the Red Hot Chili Peppers, claim not to want other people’s glory, but simply enjoy letting loose on stage. Strange as it may sound, they say it’s equally important not to lose their individuality.